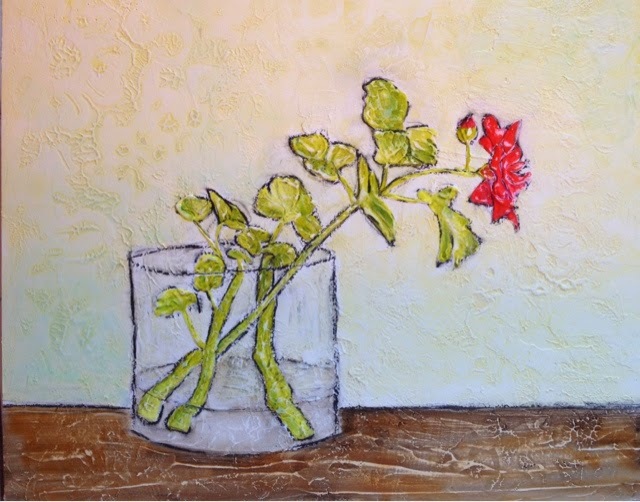 The Art of Robin Baratta: Cuttings: Is It Spring Yet? Cuttings: Is It Spring Yet? Last fall I took cuttings from my geraniums and put them in a glass on my kitchen window sill. All winter they've quietly been growing roots, and I'm sure dreaming little green plant dreams of spring. I'll admit that other than making sure they didn't run dry, I haven't paid much attention to them, so I was caught by surprise this week when one of them started to flower. It made me happy on a day I was feeling blue. So I'm sharing my happy, in a painting.